Andipa Contemporary is delighted to announce reCAST, a new solo exhibition marking a pivotal transition in the working methods and materials of esteemed contemporary British sculptor Peter Burke. This selling exhibition will juxtapose Burke's new 'earthworks' with his compelling and distinctive cast steel figures - already internationally collected and exhibited at preeminent institutions including the Peggy Guggenheim Collection, Venice. 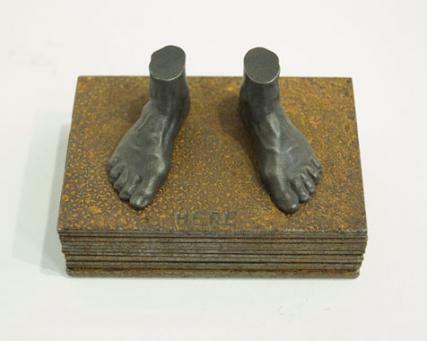 Peter Burke has long been fascinated with the precision of mechanical processes, industrial casting and mass production. His background as an engineer for Rolls Royce has contributed to the technical brilliance of his works in steel, which have explored the effects of repetition and the disorientation created by the modern world's seemingly endless creation of identical products. He has questioned the position of the individual in themass of the contemporary world and the subtlety of the human form in the face of ubiquitous standardisation. This exhibition showcases a new body of work for the sculptor. He has moved away from the workings of industry with its complex processes of production towards the simple act of digging and excavating the natural. 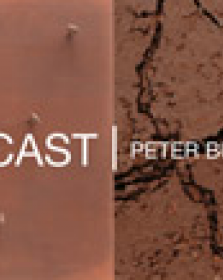 In the same way that many great artists including Richard Long have been fascinated with the earth, with walking and with the power of the earth, so Peter Burke has turned his eye and his mind to analysing the earth and our relationship to it. reCAST is the first time Peter Burke has shown his 'earthworks', and the show is a prelude to the much-anticipated Bath Museum solo show: Earthworks, in December 2011. reCAST juxtaposes these life size earthy forms which confront the viewer on an equal scale with his detailed miniaturised steel casts. While the material of these bodies of work differvastly, both are expertly harnessed to explore Peter Burke's fascination with the expressive potential of the human form, and man's predisposition to recognise and read it with an intensity that accords to no other visual activity.